Recovered chemical munitions require safe and secure storage pending destruction due to their often-deteriorated conditions. 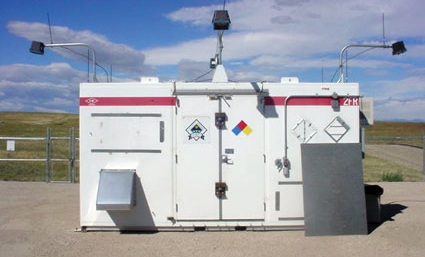 Interim holding facilities (IHF) provide safe, temporary storage for recovered chemical warfare materiel at sites where storage facilities, such as igloos and bunkers, are unavailable. The interim holding facility provides safe storage for recovered chemical warfare materiel. Engineers developed stringent construction and safety requirements for the IHF. The IHF’s design allows for the installation of a chemical agent filtration system, if necessary. The facilities consist of fireproof and corrosion-resistant materials. Light switches and fixtures, outlets and air conditioners must meet strict non-explosive design requirements to reduce the risk of fire inside the IHF. Additionally, the IHF includes a secondary containment area below the floor that would contain liquids should a leak occur. The IHF includes high-security locks and remains enclosed in a fenced area. Automatic lights attached to the IHF maximize lighting at night. Additionally, a visual security system and agent monitoring of the IHF is conducted until the recovered items are removed for treatment.